A Resident Attendant provides a variety of services to residents with the goal of assisting residents to live as fully and as independently as possible with a good quality of life. i. Prior experience working with the elderly, in wait service, housekeeping, volunteer service with older adults, community senior care programs preferred. ii. An individual in this position may be required to carry or lift weight in excess of 35 pounds with assistance. iii. Ability to feel, hear, see, smell, speak, and taste adequately to perform the functions of the job. Attendant must be well groomed and clean at all times. Clothing should be comfortable, good support shoes for Active Work. Generally 8 hours per shift. Days of week and work shift may vary. Schedule includes every other weekend. 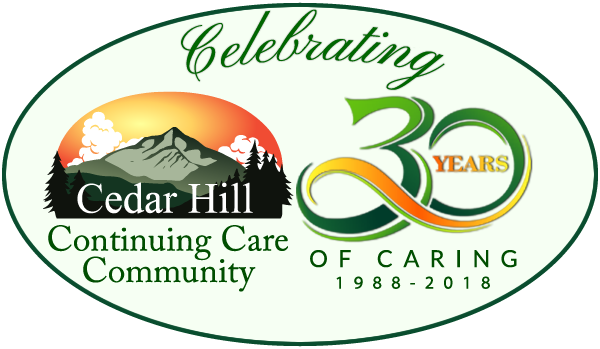 Cedar Hill policy is to accommodate the needs of residents first, but consideration is given to individual worker preferences and needs with respect to work shifts and work schedules. a. Understands and follows Resident Rights Regulations and facility’s policies and procedures related to resident care and safety. e. Meal Service – Assist residents with meal selection, serves meals, helps with clean up, set out snacks and monitors availability, monitors food intake, respects likes and dislikes, cultural food preferences, reports consumption problems to the Resident Services Director/Supervisor of MCC. f. Resident Care – Assists residents with personal care as assigned recognizing the important of having each resident function to his/her fullest capabilities, assisting only as required. Records personal care given on designated forms and/or EMR. Participates in assessment service plan development as appropriate. g. Assistance With Medications Provides assistance with medications per service plan, under the directions of Memory Care Center Supervisor/Resident Services Director. Documents med administration as required in EMR and as needed on paper MR.
h. Activities – Encourages and assists residents to enjoy activities of their choice and community sponsored activities. Works collaboratively with the Activity staff to enhance the quality of life for the residents. i. Transportation: Transports residents to scheduled medical visits, shopping trips and personal appointments as assigned. Always follow safe driving rules. i. Records mileage and time on designated forms. j. Continuing Educations – Willing participation in continuing education or training in order to improve knowledge, skills, and service to residents. Minimum 12 CEUs per year. k. Completes annual competency testing successfully. l. Performs other duties as assigned within scope of the attendant’s capabilities.